Last week Secretary of the Navy Swanson marched into the White House and announced that he had found another worthy Roosevelt for the Assistant Secretaryship that was held by Theodore Sr. (1897-98), by Franklin D. (1913-20), by Theodore Jr. (1921-24), and by T. R. Sr.'s nephew Theodore Douglas Robinson (1924-29). President Roosevelt was said to have had no hand in the selection of Secretary Swanson's "find": Henry Latrobe Roosevelt, 53, a burly, round-faced onetime Marine Corps Colonel. The President promptly made the appointment and just as promptly the Senate confirmed it. The Marine Corps will be in his province. The President and the new Assistant Secretary of the Navy are fifth cousins. Nicholas Roosevelt (1658-1742) was their common great-great-great-great-grandfather. Henry Roosevelt is a third cousin of Theodore Roosevelt Sr., their common great-great-grandfather having been Jacobus Roosevelt, grandson of Nicholas. Though closer kin to the Republican wing of the family, Assistant Secretary Roosevelt is a Democrat, has been acquainted with the President for years. After three years at the U. S. Naval Academy, he resigned to take a commission in the Marine Corps, saw service in the Philippines, Panama, Cuba, Haiti. During the War he was assistant quartermaster at Marine Barracks, Quantico. Va. Resigning in 1920, he became European representative for Radio Corp. of America with headquarters at Paris. His wife was well-to-do Eleanor Morrow of San Francisco, daughter of a Federal Judge (no kin of the Englewood, N. J. Morrows and their Anne Morrow Lindbergh). Born at Morristown, New Jersey, October 5, 1879, the son of Nicholas Latrobe and Eleanor (Dean) Roosevelt, Henry Latrobe Roosevelt attended the United States Naval Academy (class of 1901), but was not a graduate. Married Eleanor Morrow, January 15, 1902. His children were: William Morrow, Henry Latrobe, Eleanor Katherine. Commissioned a Second Lieutenant, United States Marine Corps, 1899, and was promoted through the grades to Lieutenant Colonel. During the Spanish-American War was attached to USS Mayflower, operating off the coast of Cuba. Was Assistant Naval Attache, Paris, 1914, served at Headquarters, US Marine Corps, 1914-16, served in Haiti in 1916 and was a Colonel in Gendarmerie d'Haiti (the provisional police force keeping peace there, which was commanded by US Marines). Assigned to Quantico, Virginia, from 1917 until he resigned his commission in 1920. Was with the Radio Corporation of America (RCA) in 1923, their European Manager, 1925-30 and then was President of Readio Real Estate Corporation from 1930-33. In 1933 he was appointed Assistant Secretary of the Navy. He made his home in Washington and died there on February 22, 1936. He was buried with full military honors in Section 2 of Arlington National Cemetery. 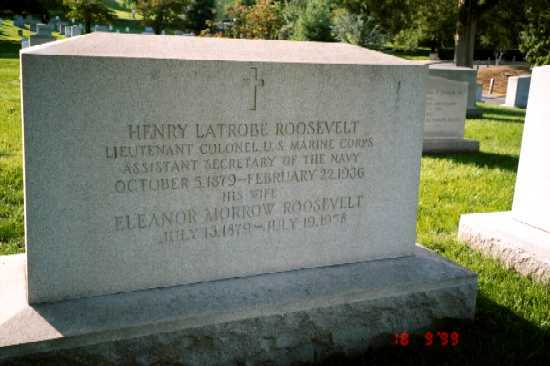 His wife, Eleanor Morrow Roosevelt (July 13, 1879-July 10, 1958) is buried with him. 1921 through 1924 under Harding and Coolidge, Theodore Douglas Robinson (the son of Corinne Roosevelt) who served from 1924 through 1929 under Coolidge, and finally Henry Latrobe Roosevelt, a descendant of Robert Fulton's old friend "Steamboat Nicholas" Roosevelt, who served from 1933 through 1936 under Franklin D. Roosevelt. The President was relatively scrupulous about giving public positions to relatives, although he could not resist appointing a Roosevelt as Assistant Secretary of the Navy - a "family tradition," he said. The fifth member of the dynasty to hold the post was Henry Latrobe Roosevelt, European representative for RCA and a great-grandson of the steamboat inventor. Henry Latrobe Roosevelt was born on 5 Oct 1879 in Morristown, New Jersey. He died on 22 Feb 1936 in Washington, D.C. and was buried at Arlington National Cemetery. 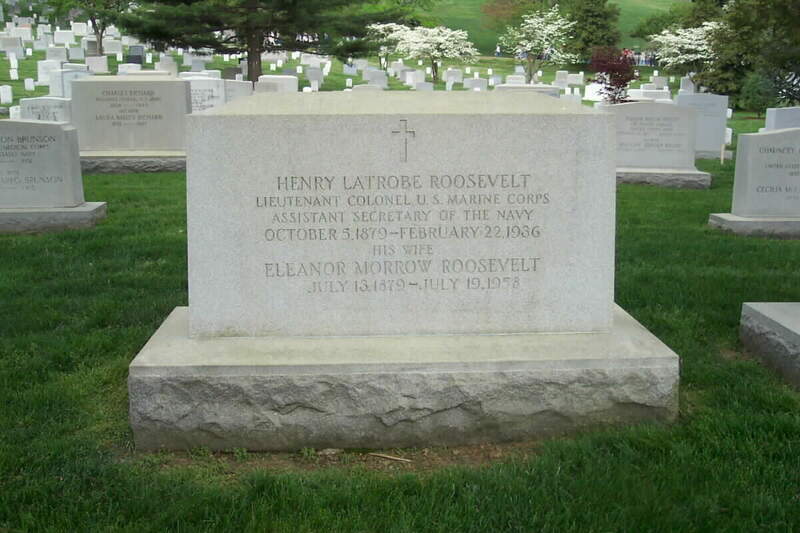 In 1933 Henry Latrobe Roosevelt was appointed Assistant Secretary of the Navy by President Franklin D. Roosevelt. He was the fifth Roosevelt to be Assistant Secretary of the Navy. Others were Franklin Delano Roosevelt and "Teddie" Roosevelt. He was a graduate of the Naval Academy Class of 1900. He joined the Marine Corps, rose to the rank of lieutenant-colonel and resigned in 1920.